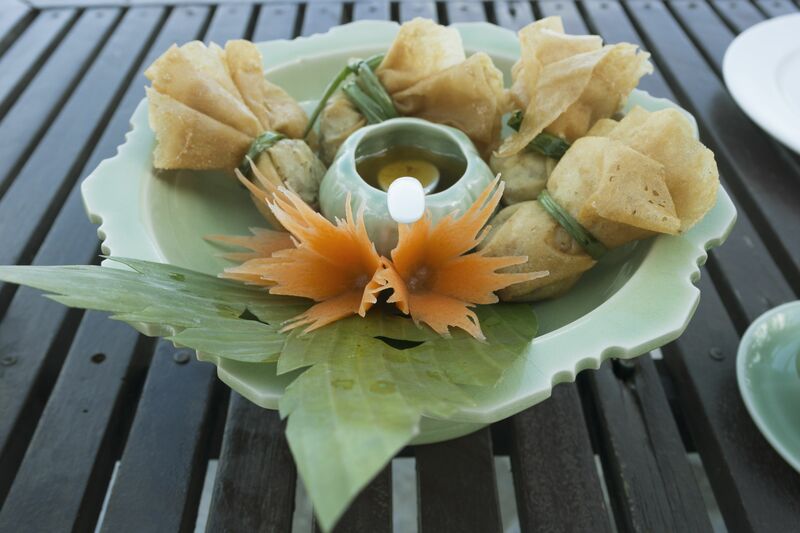 One of the best-known Asian-inspired appetizers, this deep-fried snack features wonton wrappers filled with crabmeat and cream cheese. It's always a hit and an excellent option to serve at a party or just before dinner. Wild about wings? This recipe consists of baked chicken wings that are coated in a hoisin sauce and honey marinade. They're finger-licking delicious on their own or served with your choice of rice or vegetable on the side. These spareribs can be prepared ahead of time and refrigerated or frozen. Combine the ribs with the marinade and—when it comes time to cook—all you need to do is place them in the oven. This easy-to-make party dish tastes best with fresh water chestnuts, which can be found at your local Asian market. The secret to the simple appetizer lies in soaking the chestnuts in soy sauce and rolling them in brown sugar before baking. These delicious chicken lettuce wraps are seasoned with oyster sauce for an umami punch. They make a great appetizer and leftovers can be served for lunch the next day. 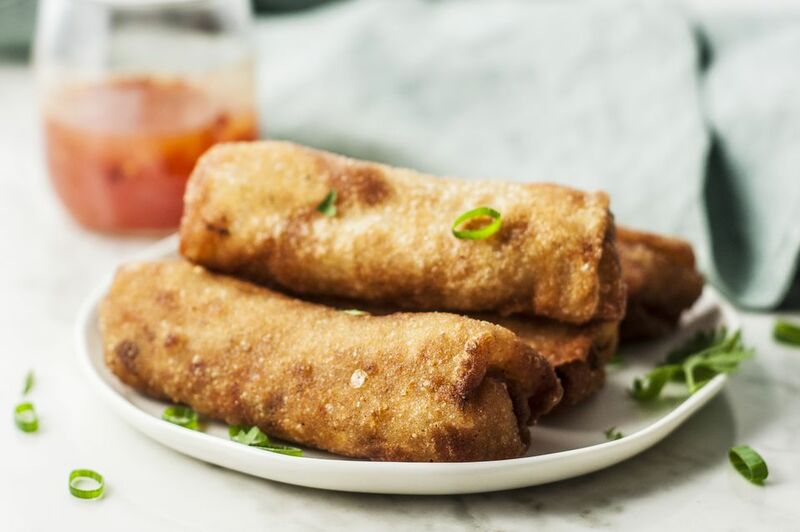 Egg rolls are the perfect party food. This recipe includes instructions for folding the wrapper. Potstickers may look complicated, but don't be intimidated by the folding process—this recipe will carefully guide you through each step and also includes a soy and sesame dipping sauce. Feel free to substitute wonton wrappers for the dumpling dough if that's what you can find. Peanuts are a symbol of longevity in Chinese culture. In this recipe, the nuts are coated in a sweet-spicy mixture with corn syrup and five spice powder. Here's another easy wings recipe, this time calling for a classic oyster sauce dressing. For this one, feel free to substitute dry sherry or rice vinegar for the rice wine. For a delectable fried spring roll with the best of Cantonese flavors, try these spring rolls packed with shredded pork, shrimp, black mushrooms, and garlic chives. Fear not, vegetarians! Many of the recipes on this list are easily adaptable to a meat-free diet. With tofu, bok choy, bamboo shoots, and other delicious fillings, these vegetarian potstickers will impress regardless of the dietary needs of your guests. A favorite in Hong Kong, honey walnut prawns are typically an entree, but can easily double as a highly delicious party appetizer. The deep-fried shrimp is a perfect combo of sweet and savory and makes for excellent finger food. This Chinese-Canadian take on spareribs will leave you with sticky fingers and a full stomach. Boiled in water, then simmered in brown sugar, garlic, soy sauce, and mustard sauce, you won't want to skip out on the tasty little nuggest. For a recipe that's a little healthier than what you'd get in most restaurants, try these delicious spring rolls two different ways to suit whatever your guest's dietary preferences may be.